As we commemorate the 50th anniversary of Dr. Martin Luther King, Jr.’s assassination this year, it is important to remember that African Americans continue to face many of the same inequalities today that Dr. King gave his life to fight for decades ago. Racial economic inequality remains a huge issue that our nation must come to terms with and resolve. There are three major indicators of economic well-being by which we commonly measure racial economic inequality—median hourly wage, median household income, and median family net worth or wealth. If taken alone, each of these measures might lead you to draw dramatically different conclusions about the current state of racial economic inequality. In 2016, the most recent year for which all of these data are available, the median black worker earned 75 percent of what the median white worker earned in an hour; the median black household earned 61 percent of the income the median white household earned in a year; and the value of net worth for the median black family was just 10 percent of the value for the median white family. Related to these relative proportionate differences is also a wide range of absolute differences. 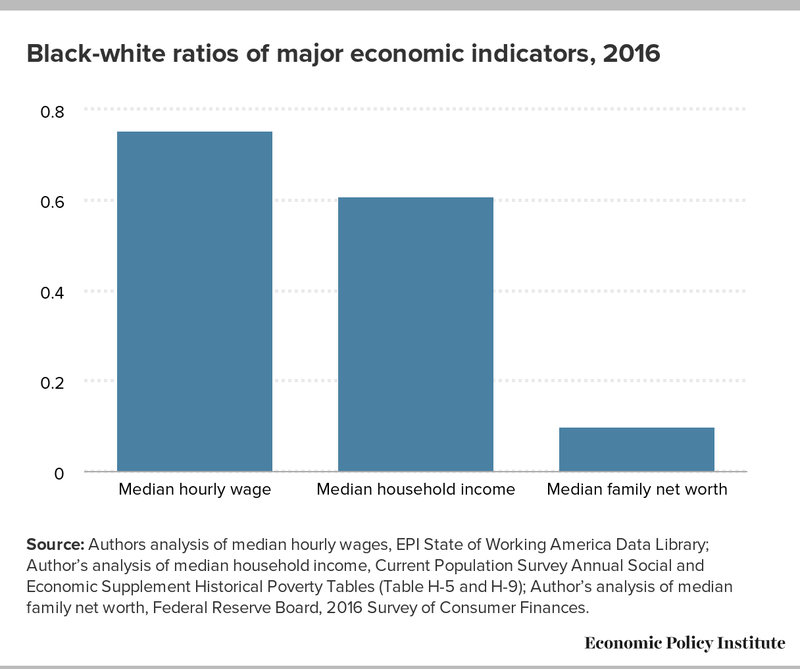 While median hourly wages vary by a few dollars ($14.92 for black workers, $19.79 for white workers), the difference in median household income is tens of thousands of dollars ($39,490 for black households, $65,041 for white households), and the difference in median family net worth is hundreds of thousands of dollars ($17,600 for black families, $171,000 for white families). Source: Authors analysis of median hourly wages, EPI State of Working America Data Library; Author’s analysis of median household income, Current Population Survey Annual Social and Economic Supplement Historical Poverty Tables (Table H-5 and H-9); Author’s analysis of median family net worth, Federal Reserve Board, 2016 Survey of Consumer Finances. African Americans and other low-wage workers can, and often do, attempt to compensate for lower wages by working more hours per year to boost income from wage earnings, but the racial disparity in median family net worth is a much harder gap to overcome for several reasons. Wealth provides a degree of economic stability against the uncertainties of job loss, major illness or death—any of which can dramatically cut wage earnings and household income. Wealth also affords access to any number of mobility-enhancing opportunities, such as ownership of property or other kinds of appreciating capital assets, debt-free higher education, or building a secure retirement. Inheritance, or the transfer of wealth (or the lack thereof) from one generation to the next, then further expands these racial gaps over time. All of these measures of racial economic inequality show that we are a long way from remedying the vestiges of racism and the centuries of federal, state, and local policies that created these disparities.